I headed back to Blogger for a variety of reasons – mostly because the majority of blogs that I like to read are on Blogger. Whenever I want to comment, I have to go through this whole ordeal and let’s face it, I just don’t have that kind of time in my day. Besides, I found a pretty template for my new blog that I really like. So hop on over to http://unencumberedlife.blogspot.com/ for the new and improved blog (OK, so it’s definitely new, but improved remains to be seen). I love summer. I love the long days and being able to go outside without having to bundle up. I love sitting on our porch at night enjoying the weather and the sounds of our neighborhood (kids laughing and playing, the ice cream truck, people mowing their lawns). Griffin loves summer, too. In fact, he loves it so much I can barely get him back in the house for dinner. He loves running in the grass in his bare feet and playing in his little pool. I don’t think he cares what he’s doing as long as he’s outside. We went outside this morning so I could take him to day care. He immediately ran up to his little bike and sat on it and started saying, “Mommy…bike!” over and over. It was so sweet. I watched him for a while, wishing I didn’t have to go to work, wishing I could stay home with him and play outside. It’s days like this, these gorgeous summer days, when I get frustrated with work. I love what I do, but let’s face it, if I didn’t have to work I wouldn’t. Well, maybe something part-time just to keep my mind fresh. I feel like I miss out on so much with Griffin. I realize it on weekends when I don’t have to be anywhere. We snuggle on the couch and watch Curious George. I make him pancakes and we sit together at the kitchen table just eating and talking. I love those times with him – the everyday moments. I have no idea why I’m going on and on about this. I guess it was one of those difficult mornings where I wanted so badly to stay home with him and play and giggle. I do have a whole week of vacation scheduled for the end of July. I’m really looking forward to doing all those little things with my Griffin. Griffin is a cuddly kid. As a baby, he loved to snuggle on Patrick’s chest or snuzzle his little face in the crook of my neck. Pure sweetness. As he got older, and mobile, those snuggling moments have come in the form of just before or after sleep. He’s ready for sleep or still a bit groggy after waking up, which means his little arms and legs that are usually moving non-stop are just too tired and he needs to sit still. I love sitting on the couch with him on my lap. His muscles start to relax and his body grows heavier. Sleep is not far off. Despite his snuggly nature, Griffin won’t kiss me. Oh sure, there have been those rare moments when I bribe him with a graham cracker or a Hershey kiss, but never when I just ask for one. It used to break my heart, but then it became a running joke in our house, and then it just broke my heart again. Yesterday, on Father’s Day of all days, Griffin was giving out kisses for free. We sat on our front porch and I leaned in close to him and said, “Can you give mommy a smooch?” And he leaned in and kissed me on the lips. All day, anytime I asked for a kiss, he gave me one. I even leaned in to tell him to give his daddy a smooch and he kissed me first, then ran over to Patrick to give him one. Who knows if that will continue, or if yesterday was just a fluke, but I’ll take what I can get. I’m waiting for the painkillers to kick in so my migraine will go away. I’m eating Goldfish crackers because the meds leave a funny taste in my mouth. I’m daydreaming instead of working. I’m grateful for Patrick taking Griffin into day care this morning – my head was hurting too much to deal with the daily battle of getting Griffin dressed and out the door. I’m happy that it’s Friday – looking forward to playing with Griffin this weekend. I’m proud that I’ve been keeping up with my writing goal. I’m determined that I will finish this first draft by Griffin’s birthday (July 22) – only 21,969 more words. I’m disgusted with the Chicago Cubs, yet I feel compelled to watch each game. I’m grateful for our state-issued health insurance for Griffin. It has saved us hundreds of dollars so far…maybe even thousands once Griffin gets his ear surgery. In all honesty, based on our income, we pay NO premium, NO co-pay, and all of his generic meds are free. I can’t say enough how absolutely grateful I am to the state of Iowa. 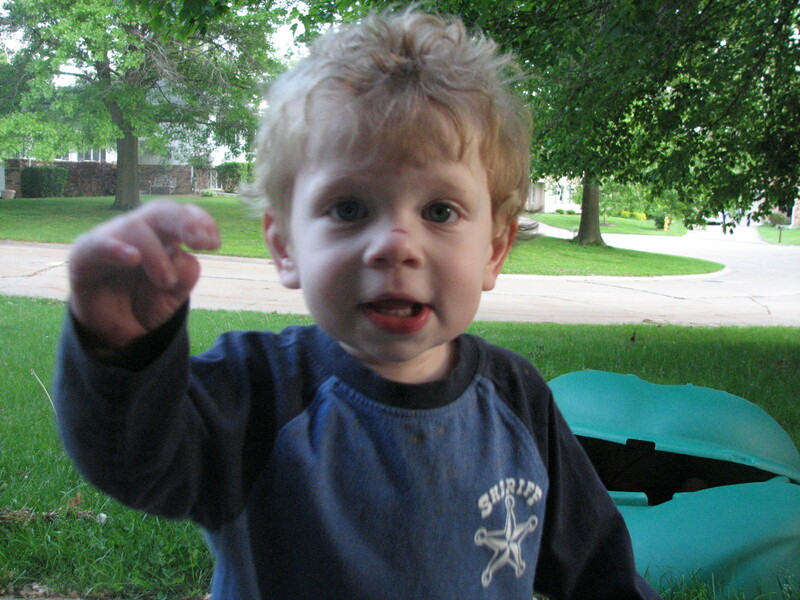 Griffin developed a nasty ear infection at the very end of April (including a temp of 103). After ten days on amoxicillin, he continued to rub at his ear and be completely irritable. OK, so some of his behavior is also due to the fact that he is just about to turn two years old. We took him back to the doctor on Monday and the ear infection never cleared up, so he was placed on a ten-day dose of Augmentin. Now, just four full days into that treatment, he starts rubbing his ear again and whining. Today we start round three of antibiotics. This time it’s Omnicef. At his appointment on Monday, the doctor said that if this doesn’t clear up quickly, or if he still has fluid in his ears at his two-year check-up, we’ll be referred to an ENT and he’ll have to have tubes placed in his ears. At this point, he’s had about eight ear infections. The majority of those have come in the past ten months. As much as I don’t want him to have to go through the surgery (and yes, I’m very aware that it only takes 15-20 minutes, but it’s still surgery and he’s my baby), I’m ready. Ear infections in toddlers are way worse than teething. So, yeah, I pretty much went from being swamped at work to being swamped at home – let’s not even mention the fact that in the past few weeks Patrick has travelled to Charlotte, NC twice (he’s there now) and Colorado Springs. I’m not sleeping much and it’s taking its toll on me. I hope round three of antibiotics works. For Griffin’s sake and for mine. I hate to keep saying this, but I have been swamped the past month. I’ve written more grants than I care to remember, we’re in the midst of celebrating our agency’s 40th anniversary (which includes a huge special event and fundraising), and like usual this time of year, we have our annual golf event. The golf event is on Monday and that day can’t get here soon enough. It’s the build-up to that day that just about kills me each year. Imagine planning a wedding for 200 people every year, but without the fancy dress, dancing, and cake. I’m looking forward to blogging more once the event is over. No, not “I love you,” but rather “Mama, ball rolling.” OK, so in Griffin’s toddler-talk it sounds more like, “Mama, baw row-ee,” but we know what he means. He even points to the ball as it rolls down the driveway. It might not seem momentous to anyone else, but this officially marks Griffin’s first 3-word sentence. I’m a proud Mama.